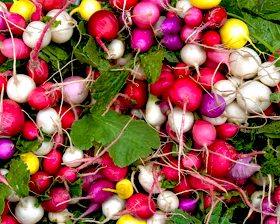 A visually stunning array of coloured skinned radishes all with crisp, white, delicious flesh. Radish Easter's Eggs have round to plum shaped roots with white, purple, pink, red, white and red, or a stunning gold skin, to add colour to your summer salads or sandwiches. Summer sowings grow quickly and will be ready to harvest in 25-30 days.